It is noteworthy that these executions were the first in France under the presidency of Armand Fallières, a very likable man and a staunch abolitionist as far as death penalty was in question. 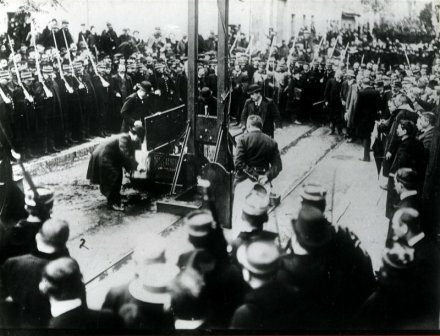 From the very start of his mandate, President Fallières, when a lawyer petitioned him a presidential reprieve ( grâce présidentielle ) for a client sentenced to death, invariably and automatically granted the reprieve. Making no distinctions as to whatever the crime or the person of the condemned was. This of course attracted attacks by Fallières’ political opponents but he maintained his line. As early as 1906 a bill was drafted by Aristide Briand the Garde des Sceaux ( Minister of Justice ) in order to abolish death penalty in France – except for military crimes and in wartime – . The first measure was a technicality : not to vote the credits for the executioner’s salary, his aides and the material, the guillotine, etc. in the law of finances ( loi de finances ) for the following year. This law pas passed. This rendered executions not carriable in practice until such credits were voted. The bill to abolish death penalty in itself was still under discussion in the Parliament when an atrocious murder was committed in 1907. Albert Soleilland, a Parisian laborer, had proposed his neighbours to take their young daughter Marthe Eberling to see the Bataclan, a popular attraction. When alone with the child he raped and killed her and mutilated her body and concealed it in gare Saint-Lazare – or elsewhere, I’m unsure of the location – . Soleilland was sentenced to death and even his wife approved openly this court decision. But the lawyer of Soleilland submitted the petition for reprieve to President Fallières. Many people, as well in politics as in the general population, were expecting Fallières to make an exception to his established line of granting a reprieve to any death sentence, given the atrocity of this particular crime. However Fallières did not part from his line : he reprieved Soleilland whose death sentence was thus automatically commuted to hard labor in the penal colony at the bagne in French Guyana. Soleilland was sent there and died there, or later returned to the Metropole, I don’t know. 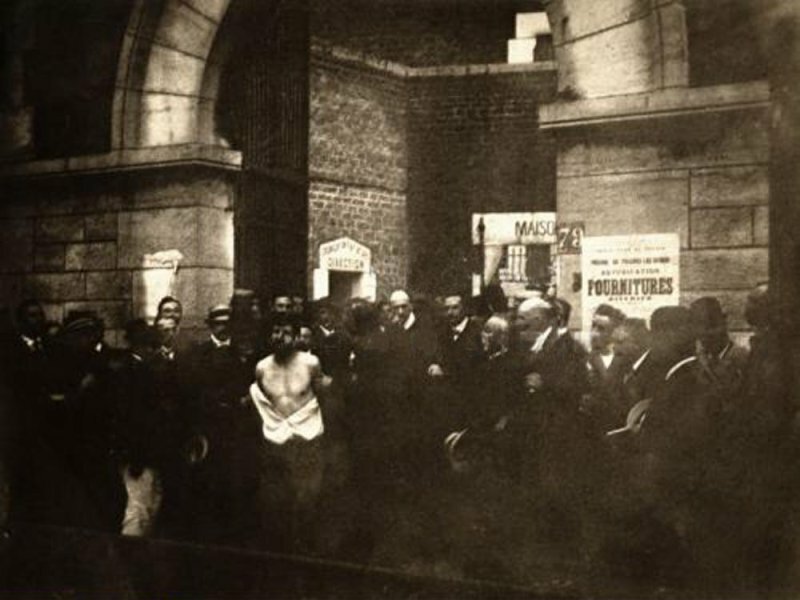 The case of Soleilland had the effect that the bill to abolish death penalty was never put to vote, discussions in Parliament were ended and the bill withdrawn in 1908. A poll conducted at that time showed that a vast majority in the population were in favor of retaining death penalty. 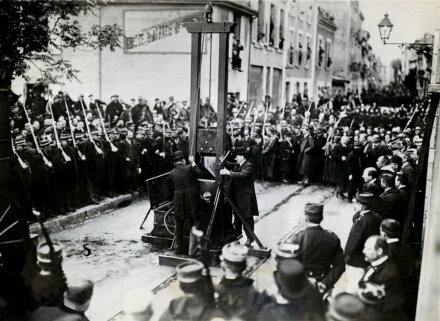 In France although many decades elapsed, not a single Government, all tendencies mixed, would ever dare to propose another bill to abolish death penalty. Until 1981, so 75 years after the first essay of 1906, and it was a bill set forth by Robert Badinter the Garde des Sceaux, at the initiative of President François Mitterrand. So was death penalty only abolished in 1981 in France. 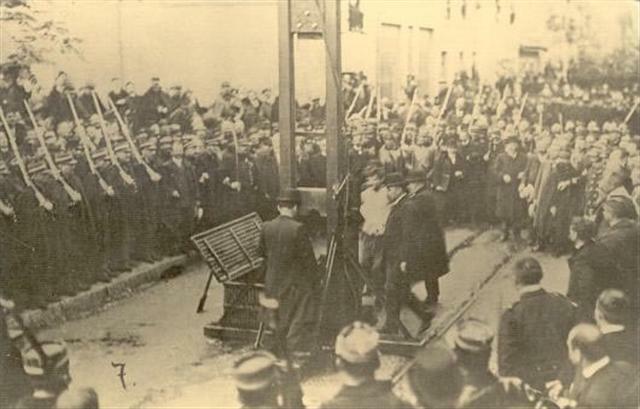 To return to the case of today, the executions of the Chauffeurs de la Drôme in 1909. As said, this time Armand Fallières decided not to grant reprieves to the three men you have mentioned. It was not so much because he had changed his mind about his abolitionist stance. He would perhaps been prepared to reprieve these men as well as all the others before. But there had been the reprieve granted to Soleilland which had been fiercely criticized. The public opinion demanded the application of death penalty. And, to turn more specifically to the case of the Chauffeurs de la Drôme, their criminal spree had caused a huge outrage in that region. These factors led Fallières to act against his own stance and to refuse the reprieves, thus letting justice take its course, to use this standardized formula. Here are some links to articles I saw today related to Armand Fallières and his abolitionist views. One article is about the brothers Pollet – they were four – who were guillotined in Béthune in Northern France, also in 1909 and thus were with the Chauffeurs de la Drôme among the earliest instances of President Fallières’ breaching his abolitionist line. A side effect was that year 1909 the establishment of censorship rules regarding cinema, what in executions matters the cinema people were allowed to film or not.